A very good version of this dish. I like the addition of shallots as an aromatics for the rice. I cut the rice down to a cup and a quarter and adjusted the amount of broth added but kept everything the same since I have to watch my carbo intake. This may become my new go-to for Chinese chicken and rice. Very good, even though the cook (my husband) overcooked the skewer a little bit and it was a bit dry. Instead of fresh marjoram, I used fresh oregano which is suggested as an alternative. Very good, served with the chicken satay. I halved the recipe and still have a lot of sauce. But this is listed under Malaysian satay party with sesame-cucumber salad together with three different satay, a beef, a lamb and a chicken and I only made the chicken one. Making a third of the recipe might have provided a more appropriate amount. Sesame-cucumber salad, not our favorite, just cucumber with coarsely ground toasted sesame seeds and black pepper, no liquid component, so it was somewhat dry. The food world's brightest new star delivers a stunning cookbook debut that present her flavor-packed fusion home cooking. Raised in Malaysia, schooled in biochemistry at Princeton and trained by Bobby Flay in the kitchen---Patricia Yeo is not your average three-star chef. But as the executive chef at the acclaimed Manhattan restaurant AZ and the soon-to-open Pazo, she has the whole food world talking. Her Asian-inspired American cooking has been called bold, playful, ingenious, satisfying, and addictive. With recipes like aromatic tea-smoked chicken, savory miso-braised shortribs, and heavenly lime and ginger creme brulee, Yeo brings together sweet and sour, spicy and tangy, smoky and pungent--resulting in dishes that are both refreshingly new and reassuringly familiar. 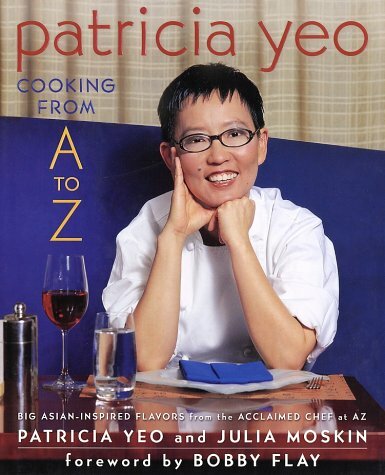 With this debut, Yeo joins her fellow top chefs on the highest tier of the cookbook shelf. Filled with more than 130 recipes, culinary information, seasonal notes, and beautiful color photographs, this is sure to be one of the most celebrated cookbooks of the year.